have any sucess with other cleaners/sealers on composite? We are hoping to find a less expensive product that is effective. Power washing will enhance results when cleaning your TimberTech deck. 1500psi is the recommended maximum for TimberTech products. A fan tip nozzle should be used along with the proper cleaning product. 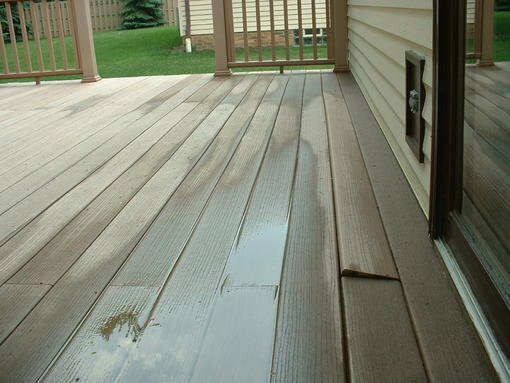 Spray in the direction of the brush/grain pattern to avoid damaging your decking. Use caution not to damage the material and always take the proper safety precautions when operating a power washer. Wash your deck periodically with a cleaner like Zinsser's JOMAX (www.zinsser.com) that contains or is mixed with Sodium Hypochlorite. Follow the manufacturer’s application instructions. Use a stiff brush to scrub heavily stained surfaces following the grain. Rinse off your TimberTech deck periodically with a hose. Even if your deck appears clean, it is important to prevent build-up of pollen/debris. Mildew stains may occur where moisture, pollens, and/or dirt are present. Mildew needs a food source to grow, which can be grass, pollens, dirt, debris, wood and wood resins. Maintaining a clean, dry deck surface is the best method for combating mildew. Ensure that water drains effectively from your deck. Keeping weep holes clear and unclogged on TimberTech Floorizon Planks. For TimberTech TwinFinish 5/4 and 2x6 planks, be sure that gaps exist between planks to allow for drainage. Oil Eater Cleaner and Degreaser is very effective against oil, grease and other stains. For extra heavy oil and grease stains or other specific stain types, check with your local lumberyard, hardware stores or home centers for cleaners applicable to a specific stain type. If stains have set, you may want to use fine sandpaper and sand lightly, following the wood grain finish of the plank. The sanded area will weather back in approximately 8-10 weeks. I have followed the recommendations from the timbertech literature and the customer service representative. It really bugs me that they repeat over and over that pollen and environmental stuff is a breeding ground for mildew. My pressure treated lumber small decks that have stain have no problem with mildew, only the big Timbertech deck. These decks are in the same environment, except my wood decks are in full shade. 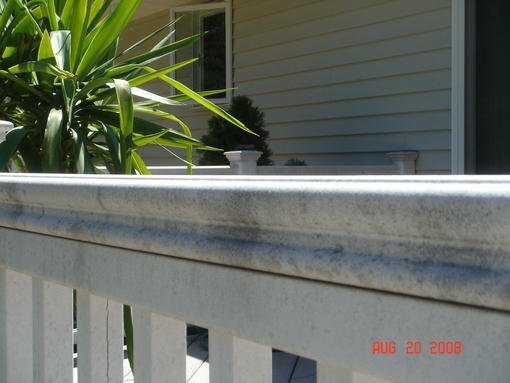 Jomax mixed with bleach has been great for painted rails and other surfaces, but it was the least effective on timbertech mildew. I have also used the Timbertech cleaning product mixed with bleach, and it was more effective, but not as effective as PSC cleaner mixed with bleach. It is really obvious to us, our contractor, and other people who have cleaned our deck that the mildew is much deeper than surface, and seems to eminate from within the material and rises to the top. If it was surface mildew, it would be coming off without having to clean and soak it repeatedly. The mildew also does not scrape off. It is deeper. The sealing after cleaning with PSC seems to be working, although it has only been one month and we are hoping it stays mildew free. But that brings me back to the original complaint. After spending all this money on Timbertech, why must I still clean and seal more than I do on my pressure treated lumber? Chlorine Bleach or Sodium Hypochlorite (active ingredient in Chlorine Bleach) based deck cleaners that the uneducated recommend may appear to quickly remove mildew (white in color) and mold (black and other colors) fungus from Timbertech and other Composite Decking. Nothing could be farther from the truth. The Environmental Protection Agency (EPA) and the Occupational Safety & Health Administration (OSHA) DO NOT RECOMMEND Chlorine Bleach for Mold (Mildew is a species of Mold) remediation on porous surfaces such as Timbertech and other composite decking. The reason for this is that Chlorine Bleach does not remove or kill the roots (mycelium) of the fungus, but actually waters them. A few weeks after you have cleaned a deck with chlorine bleach or sodium hypochlorite based products you will notice the mildew or other mold fungus growing back in greater numbers, especially after additional moisture comes into contact with the deck. It will make the problem worse and harder to remove the next time the composite surface becomes unsightly. In addition, Chlorine Bleach products reek havoc on the rest of the deck structure shortening the life of the entire structure. It is highly corrosive to any metal including structural connectors or fasteners (screws) holding the deck together. It shortens the life of the pressure treated lumber supporting the deck. This could lead to liability issues for the owner of the property and any company who recommends its use. PRODUCTS THAT CONTAIN SODIUM HYPOCHLORITE ARE ENVIRONMENTALLY DESTRUCTIVE. It is shocking that Timbertech and other composite manufacturers do not follow the recommendations of the EPA or OSHA and recommend one of the most TOXIC chemicals known to this earth. You may want to review the label directions of bleach containers before mixing anything with it and using it for purposes not stated. This violates federal and state laws, pollutes and is dangerous. An excellent point, even though the company recommendations include the use of • Phosphoric Acid • Oxalic Acid • Hydrochloric Acid or • Sodium Hypochlorite always use caution with any chemical. For example I found moldex deck ( http://www.envirocarecorp.com/index.php?option=com_content&task=view&id=34&Itemid=56 ) by Envirocare but further reading found it also recommends the use of bleach. I would start a search of the http://www.epa.gov/ see what recommendations they have and go from there. I have found a product that is eco friendly and does not have any chlorine bleach in it or added to it. It is called Corte Clean. It cleaned my Timbertech deck better than anything else I tried. Love the product! Took the black mold spots out of my deck and they have not returned in months. When I used deck cleaners that contained sodium hypochlorite they returned with in weeks. I am about to purchase the Timbertech Floorizon T&G product for my new deck. Was your mold problem on the Floorizon line or on one of the other Timbertech products? I have been working with TT material a long time. The Floorizon (T&G) material will stand up and be beautiful if you make sure you install it correctly. Read the Installation Manual on proper installation requirements. 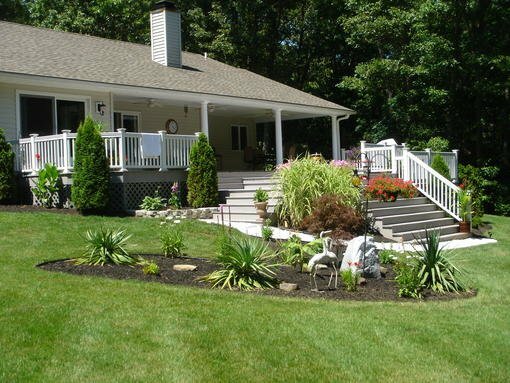 If you plan on building your deck close to the ground or enclose it, check first. Floorizon requires at least 12" of un-obstructed airflow on at least three sides of the deck. If you have that great! You will love it! Easy to install and maintain. As far as mold and mildew, Corte-Clean is the best cleaner out there thus far! It is also Environmentally safe! Check out their website. Awesome before and after photos. Its been a long time since I've posted. I still have perpetual maintenance with the Timbertech deck, and still regret building with it due to mold problems. I do not have trouble with rot or splinters, though, as some other composite owners have complained. If I can find the "magic" cleaner and protector at an economical price, I would not be so angry about this, still. My routine the past two years is to keep it free of debris once a week with the leaf blower. In the early spring and in the fall, when it is too cold to use PSC cleaner/protector, I clean it with Dawn dish soap and clorox, diluted. It looks OK for a few weeks. Around June or July when I see there will be several dry days in a row, I use the very expensive stuff. PCS deck cleaner and restorer. It takes one day of cleaning, another day to dry, and then I apply the Restorer to make the deck more waterproof. This seems to prolong the time between reappearance of mold black spots. Then in November, before the snow flies, I clean the deck again with Dawn and Clorox. After a long winter, it always looks very dirty, and I like to get it clean as soon as we can. Neither Corte-Clean, nor PCS can be used when it is still under 60 degrees. I am tired of spending all this money and effort on a "low maintenance" deck. I bought some Corte-Clean online, could not find it at local retailers. I am going to try this product this spring as it has had good reviews. I'm thinking that it would still be wise to recoat it with protector after Corte- Cleaning it to keep water out. If you are thinking about installing a composite deck, I would discourage it. If I had to do it over again, I would have gotten a few boards, put them outside for a season, to test them for quality. If I had done this, I would have seen the utter failure of Timbertech to maintain a decent appearance. If anyone hears of a class action suit against this company, it would be a responsible thing to join. I would have to agree that mold and mildew are troublesome and can get very aggrivating when you have to deal with it alot. As I have stated previously, I stand behind TimberTech products 100%. They have a mildew inhibitor in their formula that helps prevent mildew and mold from growing in their products. You have to remember when buying anything that will be exposed to the outside elements that mildew can happen and probably will. Take your house siding. It can do the exact same thing. If you do not wash it once in awhile, how is your house going to look after no cleaning or maintenance? Same is true with composite decking, railing and fencing. I have had great sucess with Corte Clean. The best sealer to use is Sun Frog, found on the web at www.sunfrog.com. I ahve used corte clean and sun frog on the same deck and had great experiences and customers are very pleased. I would say if you have bought your TimberTech material before they started introducing their mildew inhibitor, that may be why you are having the issues. I believe they started adding it to their formula in 2001 sometime so that would mean the products would have been on the market the next year. Dont be discouraged, it really IS a great product and their new products are even better and improving every year! They even have a new Maintenance Free product called XLM. And it is just that Xtreme Low Maintenance! Great product. Look into that! We're at the end of our first full season with a new TT deck and are starting the cleaning chore. I'm experimenting with a few products and techniques and could use all the help out there. It appears we have 4 types of cleaning: 1) mildew (will be trying Corte Clean and Jomax as recommended by TT, along with a product from our local lumber store. Too bad we have to wait until the temp is above 65 as stated on the Corte Clean product.) 2) minor grease spots around the picnic table, BBQ, etc. 3) other types of spots, and 4) ground in dirt, pollen, etc. I'm going to try the Jomax today which calls for using an EPA registered household bleach. The Jomax was recommended also by the folk that built the deck. I'm beginning to believe that these products (not counting Corte Clean since we haven't been able to try it) are all focused on mildew and not on "deep cleaning". What appears to be left after the cleaning are some greasy spots and the ground in dirt and pollen. For the greasy spots I'm going to have to look for something to clean. Is dishwashing liquid or TSP a good idea? TT does have a brand recommended on their site too. I've been reluctant to use any power washer for fear of damaging the wood, but, given TT saying on their site just to be careful and not to go above 1500psi I think I may give that a try for the dirt (and also to save my back). Other than using a wide fan nozzle, keeping the pressure down, and holding the spray away from the decking, are there any other tricks? Should I be putting anything on the deck after the cleaning? I tend to prefer to not add stuff after I went to all the work of cleaning it, but not knowing how the TT material works I may be being naive. Since my impression is this chore will require multiple products and approaches I sure could use some wisdom and experience on how to keep this sucker clean. The JOMAX is great at removing dirt and mildew so it should take care of most of your project. All you need to add is regular household bleach to the JOMAX. You may have to do some agitation on the ground in dirt but this product does work very well. As far as the greasy spots I would try warm water and dishwashing liquid. I would stay away from the power washer as you may end up damaging the deck if you are not use to it. The use of Corte Clean can be used in conjunction with a power washer. On the TimberTech website, their is a useful video that illustrates who to accomplich this. Corte Clean also has a great dvd illustrating useful ways to use their product for deck cleaning. TimberTech does not require the use of all the different products to clean it. You can pick one product and go with it. There is no need to add anything after you have cleaned your deck. I highly recommend going with the power washer and cleaner to get all the dirt and debris off the decking planks. Good luck and refer to TImberTech's website for any help! Their warranty dept is great at answering questions and are very helpful when i have called in. I too bought Timber Tech decking and was sucked in by the promise of the low-maintenance qualities that the company advertising purported and my contractor seconded. Not only is it as much work as cedar and pressure treated decks I've owned, it cost me a sizable premium to install it. Two applications of JOMAX along with an hour of scrubbing on my hands and knees resolved on the lightest mildew stains. The entire 14' x 20' deck and stairs are still filled with thousands of dark nickle-sized stains that won't come off. I'm ashamed this product is made in my native state of Ohio. Is it any wonder consumers buy foreign made products and American companies to out of business? If you're going to buy junk, you might as well buy cheap junk. Their maintenance page tells you to hand sand the entire deck. Got a summer to do that? The principles of this company must be guffawing and belly-laughing in their corporate offices thinking about all the dim-witted consumers that bought this stuff. Never again. I installed a Timbertech deck 2 years ago. I would not recommend Timbertech as the product requires an excessive amount of maintenance. In the spring the dirt and mold spots will not come off without vigorous scrubbing with a cleaning solution. My deck is 32 X 16 so this kills a weekend. I have friends who have Trex, etc. and they clean much easier. The mold spots are particularly stubborn and appear to be below the surface and they are slightly visible after cleaning. The weep holes also have to be cleared of debris so the deck drains properly. This goes on from March to June as we have many trees in my area. I have used the JOMAX cleaner but will try some of the others mentioned. Good luck to everyone. What Timber Tech did you use? Earthwood? We checked Consumer Reports and timber tech scored excellent on mildew...perhaps the newer products now no longer have mildew problems. We live on the West Coast so I wonder if that would make a difference. After reading all the complaints I wonder what we should do. Hi folks. In the continuing saga of maintaining Timbertech deck, my suspicions are confirmed. Others are having the same maintenance nightmare I've had with Timbertech composite decking. Someone from the company probably reads these blogs and offers positive comments to deflect criticism of Timbertech. DON'T BUY IT! I'm warning you! I spent all of today and much of yesterday doing the most dreaded maintenance job I have-cleaning and sealing the Timbertech deck. My 19 year old pressure treated small decks are so easy comparatively! I just pressure wash them and apply a coat of stain annually. But, the Timbertech deck is more involved! First, I have to clean the mold off three times a summer. (It comes back quickly)The first time, I clean in March or April with TSP, Clorox, and Dawn dish soap. The wonderful Corti-Clean cleaner can NOT be used under 60 degrees, so we can't use that till our second cleaning when it warms up in June. THEN, I seal this deck with an expensive product called PSC Protector, (developed after TREX lawsuits). Note this: Use PSC protector or another composite sealer! Every little place that doesn't get covered by the sealer becomes moldy! The number #1 product I've found helpful is the Sealer!! When mold comes back, it is just on the surface, and cleans off well with either Corti-Clean (if above 60 degrees), or TSP, or Jomax, and Bleach. My deck still doesn't look good, but at least I have conquered the mold problem with sealing and cleaning. I don't like the color from frequent bleaching. It looks smudgy and un-uniform in color from the sealer. Has anyone else used composite deck sealer, particularly McCloskey composite deck stain from Menards? My neighbor used it on her composite deck disaster last fall and it still looks good-no mold, no stains. It fared better than mine over the winter, having used sealer and cleaner. I am going to use her deck as the "guinea pig" and see how the McCloskey stain holds up over time. It was painstaking for them to carefully stain it, but they had no maintenance to do this spring/summer other than blowing the debris off with a leaf blower. Positives: I can maintain it mold free finally!. No splinters! Negatives: This is too much maintenance for a 50 year old with disc surgery! Request: Someone please tell me of staining this deck will cut down on the effort and expense of maintenance!!! The McCloskey ads look promising, but I want to hear it from real people who actually use the stuff!!! PS. I do use a pressure washer. I use the fan spray only and hold it about 6 inches away from the deck, moving it back and forth evenly. It really helps clean the debris off and removes dirty cleaning water. Like so many of you who have installed Timbertech and suffered its consequences, I have the same views about, or, I should write, ANGER at a company that continues to market a product that is a gross failure. Not only does Timbertech discolor, absorb and retain stains, it BUCKLES, CRACKS and SLOUGHS OFF resulting in an unsightly and virtually unuseable deck. Even with absolute correct installation and the recommended regular maintenance, the product is garbage. The many, many thousands of dollars that I spent on Timbertech and labor are all for naught. The company turns a blind eye to one's inquiries -- I sent a claim to the company as a result of my problems -- and was brushed off. It was not their fault, I was told. As another Timbertech owner wrote, no wonder American buyers forgo domestic products in favor of foreign ones. If other Timbertech owners feel as I do, we should initiate a class action suit. What do you think? I have a 3 yesr old timber tech florizon deck. It needed to be powerwashed 4x between May to August to remove the black spots. I used Jo-Max and have since switched to corte-clean. Surface dirt and green areas clean up like new. After an intense cleaning you can still notice slight highlights of the "mold" spots. Within weeks they start darkening again. The spots appear around the pool area , which gets a good dousing of chlorine, as well as very dry locations. Surprisingly, spots haven't appeared around the immediate 2 feet closest to the house under our homes soffit. It seems that if it doesn't get hit with much rain, it doesn't have the problem!! This might have been a bad choice for a home in the northeast. It's now 4 weeks since the last cleaning and it's getting very ugly again. The deck is approx 60' by 40'. It is a time consuming , back breaking job for a low maintainance product. The installer, his supplier and a timber tech rep have been here to see the problem and are now waiting for a response. It was easier to power wash and stain my old wood deck once a year. of ccourse i've experienced the same unacceptable and despicable experience from having purchased and installed a Timbertech deck. I too would welcome a class action lawsuit. This expensive product was not as advertised. Would to do over I'd instgall real wood and use one of the available after market wood preservatives. My dock and bulkhead are wood (vs my Timertech deck) and my dock & bulkhead look great following one pressure washing and every two year wood preservative application. After only 2 1/2 years and after being put off by the TimberTech reps I have decided to replace the deck with real wood. This is the only choice I have because the deck is unusable as is. The attached picture was taken awhile ago and the deck is getting worse all of the time. I would be happy to join a class action suit. MAY BE JUST THE WAY THE PICTURE LOOKS BUT TO ME IT LOOKS LIKE AN INSTALLATION ISSUE. IF THE TIMBERTECH DECKING ISN'T THE TOUNGUE AND GROOVE TYPE THEN THEIR NEEDS TO BE SPACING BETWEEN THE BOARDS IN ORDER FOR WATER TO DRAIN OFF AND ON THE BOARD THAT IS COMING UP IT LOOKS LIKE IT WASN'T FASTENED DOWN. ONLY MY OBSERVATION BUT I CAN'T TELL MUCH ELSE FROM PICTURE THAN THAT. Timber tech did not stand behind my product. They sent a representative out who listened to me, was friendly and seemed sincere. The follow up was a couple of gallons of their deck cleaner. Any other follow up was overwhemingly frustrating. My deck needs to be replaced but they refused to do that off loading "blame" on me and the installation. I'll not deal with the company again. I to have mold stains on my deck which will be 4 years old. My white sand railing system really looked terrible for being so young. I must say that when i contacted Timber Tech and sent them photos that they responded instantly and have replaced all of my rail system including post covers,caps and base rings. (5-sections 8' and 7 sections of 6') they did not cover labor to install. This spring i will try the Corte Clean which i orderd yesterday. My deck is the Ornamental style. I am not sure if Timber Tech is doing anything new since i purcheased my deck boards and rail system? As we speak i am building my new sections to install shortley. All of my rails are on craigs list South Jersey if you need to look at them. I will also attache a photo that i sent to Timber Tech when i was complaining about how it was weathering. I know not a thing about Azek. Good Luck.....I beleive that anything that sits outside all year will tend to weather and mildew to some degree. Hope this helps. Another note is that i took 50 /50 water and bleach and sprayed a post and without scrubing and it seemed to work pretty good. This spring i will use the Corte Clean product that is reccommended. My rails and ballisters are ORNAMENTAL if you go to Timber Tech's web site you will see it. My deck boards are the Timber Tech grey. Go to craigs list for New Jersey and then go to South Jersry and search Timber Tech. I don't think your problem is with TimberTech, more your contractor. I have seen this before no ventilation? right? It's most likely boxed in or an on grade aplication. It's on their website and in the install manual. can you tell me how long ago you installed your timbertech and the brand of timbertech you installed.It is my understanding there are several different levels of timbertech eg; xlm & etc have you had any exp wiith fiberon at all in the past year.I noticed that some of these posts are from a few years back hoping that these comapies have since improves their products.I liv ein the new yoprk area if this helps you @ all. I am in the Buffalo, N.Y. area and was planning on doing a fairly large above ground deck with this product. After reading about all the ISSUES i'm not so sure anymore. Anyone in WNY who has had this installed for at least 2 years and is happy? The reason i was going to install this particular decking was their claim of no maintenance. HELP ??? i just read all of the posts regarding black mildew/mold spots on timbertech decking. I had a deck installed 3 years ago. After Year 1, black spots appeared all over the grey deckboards. Powerwashing for 4-5 hours gets rid of for a couple of weeks and then back again. There is a law firm in CA that is considering a class action suit againts the Company. They've reached out to me already. I spent 10K on TT materials for my deck, and unfortunately a very bad choice. I'd do anything to go back to wood. This stuff is much higher maintenance than wood. You shouldn't have to clean and scrub for countless hours on such expensive, "low maintenance" products. This company lies and makes false claims about its products. AFTER GOING TO THE BUFFALO HOMESHOW THIS YEAR I WAS CONVINCED TIMBERTECH WAS THE PRODUCT I WOULD USE FOR MY NEW ( LAST TIME I WILL DO THIS ) DECK. HOWEVER, AFTER READING ALL THE BLOGS REGARDING MOLD AND OTHER MAINTENANCE ASSOCIATED PROBLEMS I DECIDED TO GO WITH THE BEST PRODUCT OUT WHICH IS NOT A WOOD COMPOSITE. THAT PRODUCT IS AZEK. IT IS A VINYL BASED UNIT WHICH IS SCRATCH AND STAIN RESISTANT AND DOES NOT REQUIRE THE MAINTENANCE OF TIMBERTECH. IT BARELY COST $ .25 /LF MORE AND IS A MUCH BETTER PRODUCT. THANK YOU ALL FOR YOPUR INPUT. I just came back from Home Central in Vestal, NY and they had small deck displays outside with three of the TT lines being demonstrated. Even their demo of the lower end basic grey materials were rich with the mold spots - I would definately not want to deal with that. The Earthwood deck sample either didn't have any of the molding spots at all, or it was much less visible. The Earthwood looked pretty nice both dry and wet (it had rained and some of the boards got wet and others didn't). Some of the other mfgs boards only looked good in the wet locations where the colors seemed much richer whereas the dry sections looked really bleached out. They had a larger deck completely built from the PVC AZEK material. This looked pretty good all the way around, but didn't have the natural wood color variations like the TT Realwood options. The other 'problem' with AZEK is that for 45 degree applications (herringbone etc) that it requires 12" joist spacing. My 2500sqft deck is all 16", so this is a bit of a pain for me. Additionally, this deck had been face screwed down which, while okay and had matching color screws, does take a little bit away from the look. A big question I'd ask of you all... those that have done the invisible attach systems out there, do the boards feel solid and don't move/flex when you walk across them? A salesman had mentioned that this was the case but I had not ever seen it online? How about opinions on the best hidden fastener system, especially considering price? Just purchased the TimberTech Earthwood model last year around Memorial Day. My installer, a family friend, gapped the boards nicely to allow for drainage and instead of using compnay fasteners, the boards were all pre-dilled and pre-colored deck screws were used. The railings were covered in white PVC coverings to match the rail system. We even had Timbertech fastened under the deck with no gaps instead of lattice so no one would see under and to keep amimals out. White trim (a composite as well) was used and the Timbertech slats were set about an inch into the ground. He took regular wood screws and created an access area for me if I ever need to get underneath. Since I do live in New England and I have trees around/ over my deck, I have noticed these black spots on the PVC railing as everyone here indicated. I tried dishwashing liquid and warm water but it still left the spots (appear like acid rain) which went from black to a dull gray. I tried to get the recommended cleaner at the Lumber Yard where the material was purchased..(What do you know, It was all sold out!!!) I was told by someone to call Lowe's and they too were sold out! !, but recommended I call Sherwin-Williams paint store..who no longer carries the product but has their own version now. We spent a lot (as everyone else has) and shied away from traditional pressure treated beacuse of the relatively "maintainence free" work promised, especially in harsh New England weather. I will let everyone know how my first cleaning experience turns out. (Other than the occasional hosing off). Waiting for the lumber yard to have cleaner in stock. Our Timber Tech deck was installed 4 years ago. After one year, spots became visible. We scrubed the deck with the recommended solution. It lightened up, but within a week or two, the spots were back. It just was getting worse and worse, darker and spreading. One product that interest us is a vinyl decking called Veka. It is not sold in our area. Any comments on Veka. I believe that it is all vinyl with fiber glass fibers. No wood in it. last week, it is sitting in my garage. After reading these posts I am considering returning it. Has anyone had a good experience with this product? Have no heard of Veka but we recently installed AZEK decking vinyl decking a bit costly but well worth it .No fading not mildew highly reccomned it. Installed PVC railing live in the New york city area this type of decking is fairly new found it at a home show in new jersey .Easy on the feet cool in the heat not slippery at all .Hope this was a help to you ..
Have seen Veka decking. I like it. Had a lot of mold and mildew with Timber Tech. They are giving us a material credit. Still very costly with labor charges. If I could do it all over again, I would go with Veka. Thanks you in advancefor your insight! Have you had a problem with the Earthwood decking itself? Is there spacing between your planks? How does it respond to heat under foot? And finally, does it show leaf staining? anyone experienced with Timbertech Earthwood product? Any probs with mildew, cleaning, maintenence? To the folks who have posted on mildew problems, which of the TT line did you use? Twin Rinish, Florizon, XLM or Earthwood? thanks. DO NOT and I repeat DO NOT purchase Timbertech decking. It is an inferior product which is NOT maintenance free nor does it resist mildew nor does it look beautiful year after year. And it add insult to injury, this stuff is not cheap. This company should be sued for false advertising. I won't be surprised to see a Class Action suit soon and I intend to be a part of it. We've had TT Earthwood teak and walnut on our deck for a year now, and not many issues. I have seen mold, but it's in an area that gets dirty from debris washing off the roof during rainy periods. Installed in September, 2008, I first saw the mold in the spring. It wasn't serious...just a small amount of surface mold on a few boards located under the roofline. My husband couldn't even see it with the elaborate "grain" pattern the teak has. I used a hose and light scrub brush to remove it, which took a little elbow grease, and I didn't see it again until now. I will wash it again before winter, maybe use Corte Clean this time, and see how it goes in the spring. I should add that I have an upper and lower deck of identical materials. The lower is protected by an Undercover System, so it doesn't get wet...just damp from misty rains. Not much mold on lower deck at all. So, in my experience, I would still recommend TT. The Earthwood is beautiful, especially with hidden fasteners. They're definitely worth the extra $. It is not entirely maintenance free, it does have to be cleaned a couple times a year, but so does everything. I hope my mold issues don't become a nightmare like some of these other stories tell. I will not go down the road of using sealers, stains, etc. I don't even want to use chemicals because they always seem to break down the deck in the long run. Good luck to you. We had a TimberTech deck installed as part of our new house construction that was completed in December 2006. Started getting a few nickel-sized black spots this past late summer/fall, and now they are covering the deck. From the other posts in this thread, it doesn't sound like it's going to be very easy to fix. I'll give it a shot, but if it's going to be a maintenance disaster, I might just rip it all out & go with something else. For some reason, my builder used pressure-treated wood railings rather than composite. These were painted shortly after being installed and there's a lot of paint blistering going on, so it might just be easier to rip all of that out too & start over. Net-net, just because someone calls themselves a "custom" builder doesn't make them so, both in regard to the quality of contractors they choose as well as their materials. Don't buy Timbertech. I have AZEK on another house and know people with Trex decks...these are truly "low maintenance" products. Timbertech is by no means low-maintenance. who did not realize how close they were to success when they gave up!" Here are two links to the product I used. I had black spots all over my deck two years in a row and could have cried! I have Timbertech and thought it would be easy maintenance. It was so much work to clean and I tried so many products. My mother in law gave me a bottle of this product that she purchased at Costco. She had used it on her cement patio and loved it. It worked like a miracle! I applied it as directed once in the spring and I did not have ONE spot of mildew or mold on my deck all through till spring. I hope you'll have luck with it too! This is my second year using this product. Before using WetandForget, I pressure wash the deck with Krud Cutter at medium pressure so as not to scare the deck. Then the next day I spray on WaF and forget it. I REALLY wish I had seen all of these posts before I had my two decks installed, app. 650 sq ft. It not only cost me more for this product but the cost of the products to try and keep it clean is very high, not to mention a waste of my time since nothing works 100% or keeps it clean very long. There is black mildew over the entire surface of the deck that is not covered and in full sun. I can't keep it clean, and I am diligent to do so. The covered deck isn't nearly as hard to keep clean. However anything will stain it. I even have darker stains from where rain water hits one area. I would give anything to have known that this product was not the low maintenance product it was described to be. I would love to have the old standby pressure treated deck!! I didn't even know I had a problem until I stumbled accross this thread! Oh I knew we had black spots on our two decks and stairs but I would apply bleach and then pressure wash every year and get rid of them for awhile. At first it cleaned the deck for most of a year. But as time went on the black spots showed up sooner and sooner. Last year it was "clean" for only 6 weeks. After reading this thread, and much thinking about an overall plan, I came up with the plan to apply corta clean, pressure wash it off and then apply wet and forget. My thinking was corta clean would clean it off and wet and forget would keep it clean for as long as possible. Here are the results so far. Application went as planned. The corta clean is absolutly temperture dependant. The warmer it is, the faster it shows visable difference. If your not worried about speed then apply at lower 60's. The main thing is it works! It cleaned the black spots off like never before. As for the wet and forget only time will tell. It does also work on black spots as I left some deck for w&f only. But the combination is what I will use from now on. I will try to remember to post later when I start seeing black spots reappear to give you an idea of how long the combination lasts. The only down side that I saw was the plants along side the deck did not like something as they burned just as badly as if I had used bleach. I don't know if it was the combination or one or the other. In summary, there is hope out there and hopefully some of you with problems will get some take-home points from this thread and get your decks looking brand new again like I did. Thanks again to all of imput. I have tried contacting the email address that is listed for a possible class action lawsuit and my email was returned. Can someone please let me know if there will be a lawsuit? I am sick that a deck I saved up to purchase for four years now looks terrible one year after me, my husband, and my 65 year old parents spent a month building it ourselves. I have contacted Timbertech and have not received a reply since sending in my receipts and a letter through the mail. The only response I got was to do a warranty claim via mail and the response was received through email. Please help - anyone know if a class action has been started? It seems like many other people are having similar problems with Timbertech lumber. From other posts, they mentioned that the lumber turned white. This is certainly not acceptable for a company that promised maintenance free use. I hope that you were able to claim fully, all your damages and costs incurred. Jdmaxdaddy, any update on how azek held up in buffalo? There is no update from Baldeaglebaby regarding the Corte Clean effect. I have deck that is two years old and has black spots on it. Do you all think cleaning it with Corteclean is the only way or there is more to it. I own a marina in Warwick, RI and are going to be doing some work next year. TimberTech decking was recommended; however, I am afraid of the mildew problem, along with scratches. Also, how much maintenance must be done each spring before the boating season. Does salt water have an effect on TimberTech? I have the Floorizon Timbertech in light gray. It becomes ugly within 2 months of cleaning. I've tried Corte Clean. It barely touched the mildew and mold. Power washing was a last resort. It is clean now, but will "ugly" up in a matter of weeks. I want to seal the deck, but the gallon price of composite sealers is outrageous. I'm thinking of covering the deck with outdooor gray carpet to keep water off of it. I really don't like any of the alternatives I've seen and tried. I live in Georgia with high humidity. A real solution would really be appreciated. My TT deck has been in for 3 years. The very first year the mold appeared. The deck is also 'wavy' after year two. I have just come in from cleaning a 1/3 of my deck and run out of steam. This is an entire weekend job with lots of scrubbing and the power washer. Never mind that we are in drought ridden California and I'm wasting precious water to clean an inferior product. Simply put: this is a terrible product and the blowback by their claims people is ridiculous given the amount of complaints they have received. DO NOT BUY TIMBERTECH products. They are the most high maintenance product and you will regret it after one year. If I can keep ONE person from buying the product, the review will be worth it. Save your money, save your back and save your water!!. In November of 2008, Mr. Rodney Sawyer contracted with Mr. David Stroud and Safrits lumber company to construct a large deck using TimberTech vinyl boards. We chose this product in-part because of the 25 year warranty and the advertised “no maintenance”. Both Mr. and Mrs. Sawyer specifically spent the extra $7,000.00 for the safety and durability of this material. In June 2009 Mrs. Sawyer started to notice cupping and warping of 9-11 decking boards. By August 2011 the warping started to present a walking hazard. After several guests had tripped and fallen due to the severe continued cupping and warping; Mr. Sawyer initiated a formal request for warranty service due to defective building materials on May the 15th 2012. On May 29th 2012 Shelley McCune, a warranty specialist with TimberTech requested that we send pictures and receipts for the boards. We sent several pictures (Artifacts 1-5 below) and the lumber company, Safrit’s Lumber in Beaufort, NC, sent the requested receipts. Furthermore; if these decking boards are not replaced quickly this defective material will become much worse and someone is highly likely to fall and could be severely injured. We spoke with TimberTech last year in regards to the deck we had built at 421 Hillcrest Dr. using Timbertech Lumber. It was explained to you the condition the deck was in and that it was a safety hazard and clearly defective material. At TimberTechs suggestion we had our contractor come out and inspect the deck to see how the boards were cupping, separating, mildew, etc. and to make sure they were installed properly. We did this and the contractor sent you a letter clearly stating that they were installed correctly and to date we never heard back from Timbertech. We have contacted Timbertech repeatedly for over a year and were told someone would be out to inspect the deck, however at this time no one has called or attempted to inspect the deck. So therefore, take care not to use this company or any of their products as it’s extremely obvious they will not honor any warranty support; even in the face of clear concise evidence; like the Sawyers you will just get the run around and then silence. There are many other companies that would make a far better building materials choice and offer outstanding customer service. The Sawyers have started a media campaign to alert as many potential consumers of this inferior products as possible. An aggressive Facebook and Twitter campaign has already reached over 100,000 consumers and will continue to post everywhere until the defective boards are repaired and the 25 year warranty is honored! I have a Timbertech composite deck approximately 10 years old. I clean and seal it semi-annually with Olympic Deck cleaner, using a pump sprayer. I do a 10ft by 10ft section, rinsing with a garden hose each section. The next day I seal it with Mold Armor Mold Blocker,sold at Home Depot. My deck looks like new each time its cleaned. I use to build custom decks for a living, and have tried many products for cleaning, and these two products together work great! Bleach is horrible for composite decks (and the environment). The previous posts about it and oxalic acid are pretty accurate. I am a chemist and work with composite decks. You may create a worse problem than you had and possibly ruin your expensive deck if you use bleach or acids. Look for a non bleach cleaner. There are also treatments to help protect the deck from mold/mildew and other stains (dont use a coating/paint or you will be in for a lot of work every couple years). We love a product called resist mist for composite decks (www.resistmist.com). Works for several years and recommended by some big deck manufacturers for remove mold, mildew stains from a composite deck. Like one of the previous members, we are working to create awareness that bleach is bad for composite decks and docks. Bleach is horrible for composite decks (and the environment). The previous posts about it and oxalic acid are pretty accurate. I am a chemist and work with composite decks. You may create a worse problem than you had and possibly ruin your expensive deck if you use bleach or acids. Look for a non bleach cleaner. There are also treatments to help protect the deck from mold/mildew and other stains (dont use a coating/paint or you will be in for a lot of work every couple years). We love a product called resist mist for composite decks (www.resistmist.com). Works for several years and recommended by some big deck manufacturers for remove mold, mildew stains from a composite deck. Like one of the previous members, we are working to create awareness that bleach is bad for composite decks and docks. There are much better solutions. Some great tips, which I have bookmarked, as i am always looking for new ways to make best use of timber tech decking.You must continue your writing. I am sure, you have a great reader's base already! Corte Clean is all you need, just follow the instructions. We had TimberTech twin-side decking installed Summer 2013. We previously had a cedar deck(550 sq. ft.)that had no issue with mold/mildew with full southern sun exposure. Cedar deck lasted 21 years. TimberTech deck is nothing but a petri dish for mold/mildew and I even have a board that is splintering in low-traffic. Tried to get company rep and customer service to have a look for themselves since mid-May but that ain't happening. This is probably the most expensive project we have undertaken and the most disappointing. Stay away from Timbertech. An all bleach solution, yes, is horrible for composite decks. We make a composite deck cleaner called Spray and Clean with less than 5% bleach that's best known for its ability to deep clean and go beneath the surface.